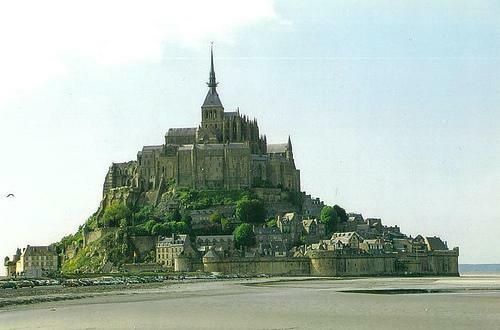 Mont Saint-Michel is a small rocky island currently connected to the mainland by a causeway. According to legend, the Archaengel Michael appeared to a local bishop in 708 AD and told him to build a church on top of the rock. He did so, and over the centuries, the church grew into a large abbey. A town also developed on the slopes, and walls were built around the island for defense from invaders and pirates. The Wonder of the Western World forms a tower in the heart of an immense bay invaded by the highest tides in Europe. It was at the request of the Archangel Michel that Aubert, Bishop of Avranches built and consecrated a small church on the 16th October 709. In 966 a community of Benedictines settled on the rock at the request of the Duke of Normandy and the pre-Romanesque church was built before the year one thousand. The Abbey was turned into a prison during the days of the French Revolution and Empire, and needed to be restored before the end of the 19th century. With the celebration of the monastic’s 1,000th anniversary, in the year 1966 a religious community moved back to what used to be the abbatial dwellings, perpuating prayer and welcome the original vocation of this place. Friars and sisters from “Les Fraternités Monastiques de Jerusalem” have been ensuring a spiritual presence since the year 2001. At the same time as the abbey was developing a village grew up from the Middle Age. It flourished on the south-east side of the rock surrounded by walls dated for the most part from the Hundred Years war. This village has always had a commercial vocation. UNESCO has classed the Mont Saint-Michel as a world heritage in 1979 and this mecca of tourism welcomes more than three million visitors a year. 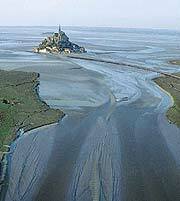 Mont Saint Michel is always accessible, and the causeway is never recovered by the water. The water starts to rise up two hours before the high tide. The parking lot is about 400 meters. Those can be recovered sometimes. Arriving on the car park, you will be told the place where you can leave your car. In case of high tide, you can let your car on the causeway. If there are too many cars you will have to use the parking lot at two kilometers. It is free of charge and situated at the entrance of the causeway. That last picture looks like something I would see in a mystical movie! wicked sweet! again great blog!